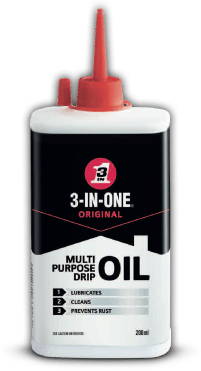 The 3-IN-ONE brand has been cleaning, lubricating and preventing rust in homes, gardens and workshops for more than a hundred years. From the original “Toolkit in a can” to a range of high performance formulas, 3-IN-ONE has become the product of choice by hobbyist and enthusiasts alike. Whether you are working at home, the garden or workshop choosing the correct product can be a daunting task. But, it can be easier with a little knowledge on what types of products are most effective for each use. The complete 3-IN-ONE range consist of the following products designed to tackle those specific jobs.